NOTE: You should only reset the last finalised GST period. If you need to reset an earlier report we recommend you talk to your accountant first. Go to Reports - GST Returns. Locate the period you need to reset and open the report. Scroll to the bottom of the report and select Revert to preview. 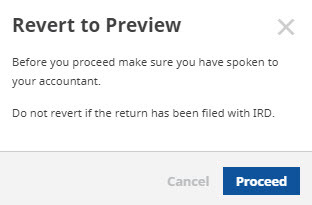 If you're sure you want to reset the GST report, click Proceed in the message box that appears. The report will revert back to a preview for you to make corrections. Don't forget to finalise it again when your ready to file it with IRD. What if your return has already been filed with IRD? If you've recently filed your return i.e. within one or two days, contact IRD and they may help you to correct the information you have submitted. 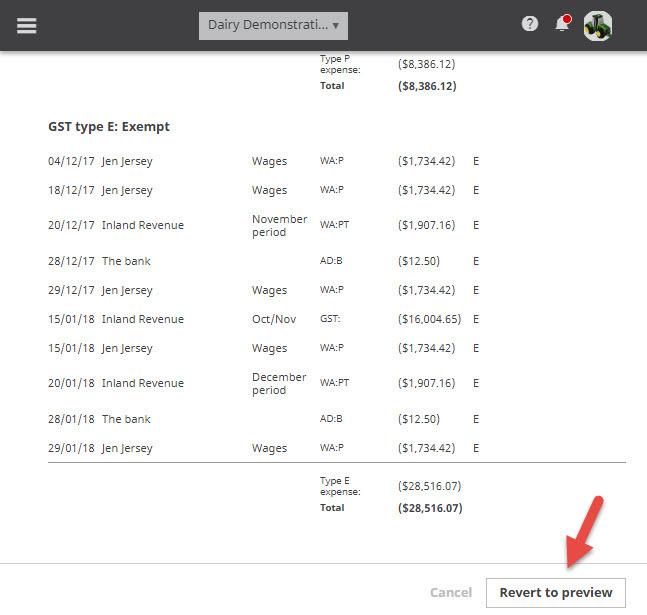 You can then reset your GST return and make corrections in Cashmanager. If the submission date for the GST period has passed, it's best to check with your accountant whether an adjustment or a reversal transaction should be made in the next GST period.